The mayoral race in Watkinsville produced a higher voter turnout for Oconee County’s Educational Special Purpose Local Option Sales Tax referendum than would have been the case without it, an analysis of precinct votes for the Nov. 8 election indicates. Overall, 10.1 percent of the county’s eligible voters cast a ballot on the education tax, putting the turnout just behind the 10.2 percent figure when the county voted on a general SPLOST issue in November of 2003. That year, as this, no other county-wide or state issues were on the ballot. In the City Hall precinct, where 75.6 percent of the registered voters also were eligible to vote in the mayoral race, 15.9 percent of the registered voters in the precinct cast a ballot for the education tax. 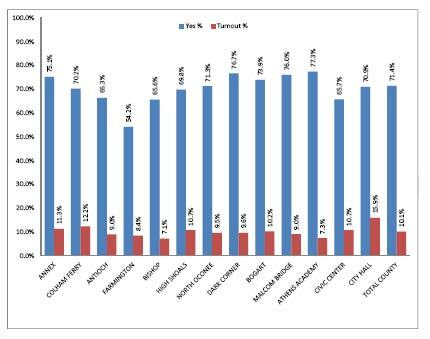 That was the highest turnout rate for the E-SPLOST ballot in any of the county’s 13 precincts. In the Annex precinct, where 36.2 of the registered voters were eligible to vote for the Watkinsville mayoral race, 11.3 percent of the precinct’s eligible voters cast a ballot on the school issue. 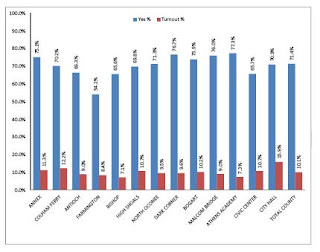 That was the third-highest turnout rate, behind City Hall and Colham Ferry. In Bogart, where the city had three candidates running for two slots on the city council, the turnout rate was 10.2 percent, or just slightly higher than the overall county figure. Of the registered voters in the county’s Bogart precinct, 32.6 percent were eligible to vote in the city race. The E-SPLOST won handily, with 71.4 percent of the 2,305 voters who went to the polls favoring it. In Watkinsville, Charles Ivie defeated Dan Matthews in the nonpartisan contest for mayor. A total of 398 votes were cast, representing 21.1 percent of the 1,885 registered city voters. Watkinsville has not had a contested mayoral race in recent memory, and the race generated considerable attention in the city, which is the county’s historical center and county seat. In Bogart, wife and husband team Linda Turman and T.L. Turman won seats in the nonpartisan race for council. A total of 188 of the 656 eligible city voters turned out, or 28.7 percent. Of the registered voters in Bogart, 82.0 percent are in Oconee County and 18.0 percent are residents of Clarke County. The votes have not yet been released by county. Watkinsville and Bogart run their own elections. Voters in both cities went to their county precinct voting spot and voted by machine on the E-SPLOST issue and then by paper with city officials for the city race. Even the Clarke County residents who were eligible to vote in the Bogart city election had to go to the Bogart precinct polling location in Oconee County to vote in the city race. SPLOST issues are usually put before voters in elections where little or nothing else is on the ballot. The belief is that those in favor will turn out, while those who are not will be less motivated to do so. And casual voters who are deciding on other matters in a larger election won’t have a chance to give a quick negative vote to a tax issue if it isn’t on the ballot at that time. The county put its most recent SPLOST issue on the ballot in March of 2009, and only 6.6 percent of the voters turned out. The issue was alone on the ballot. Turnout in the City Hall and Annex precincts that include Watkinsville voters that year was just slightly higher than the overall county rate, lending weight to the argument that the higher overall turnout rate on Nov. 8 of this year for the E-SPLOST vote was attributable to interest in the mayoral race. Oconee County voters have approved every tax issue on the ballot since a narrow defeat for an education issue in 1980. The Nov. 8 education tax vote, which extended the existing one-cent-on-a-dollar sales tax until the end of 2017, got strong support in all of Oconee County’s 13 precincts except for in Farmington in the far south of the county. Only 54.2 percent of the voters approved of the tax there. In the City Hall precinct, where most of the Watkinsville voters cast ballots, 70.9 percent of those casting ballots voted in favor of the E-SPLOST issue, or just less than the 71.4 percent overall figure. In the Annex precinct, where about a quarter of the voters are Watkinsville residents, 75.1 percent of the voters approved the education tax, or a considerably higher percentage than the overall county figure. The school tax got its strongest support in the Athens Academy precinct in the northeastern part of the county. In that precinct, 77.3 percent of the voters approved. Turnout at Athens Academy was very low, with only 7.3 percent of those eligible casting a ballot. 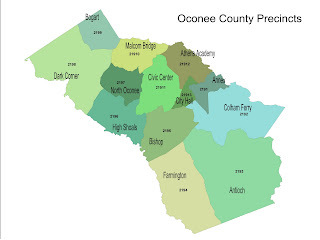 Oconee’s precincts vary greatly in size. Athens Academy is one of the largest, with 2,345 registered voters. Farmington, the smallest precinct, had only 574 registered voters on Nov. 1, the final date of tallying by the state before the Nov. 8 election. Included in these figures are both active and inactive voters, and I also used the total of all voters in my computation of turnout rates. Inactive voters remain eligible to vote though they have not voted within the last three years and failed to respond to a confirmation notice. Voters who are declared inactive and then do not vote in two general elections, that is, elections held in November in even years, are purged. Without the voters from the two Watkinsville precincts (Annex and City Hall), the turnout rate for the county (minus those two precincts) would have been 9.5 percent, or more than a half of a percentage point lower than it was on Nov. 8. The turnout rates and approval rates for the E-SPLOST by county precinct are available on the Oconee County Observations Box.net site. Any demographics to figure how many votes came from educators? I know of no data of this sort.